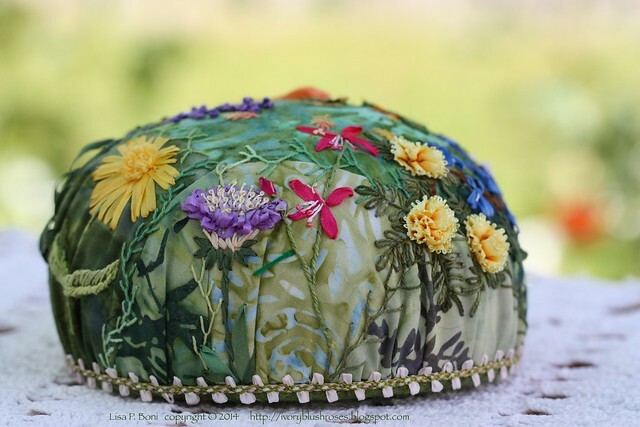 September's garden was the theme for the September Pincushion for the Crazy Quilt Journal Project 2014. Originally, I was going to focus on the theme Harvest. 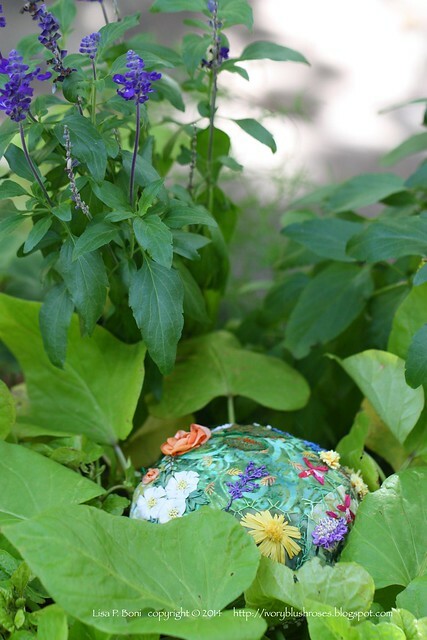 But then it occurred to me that I really wanted to do some type of wreath of flowers from my garden and that is how this pincushion was born. 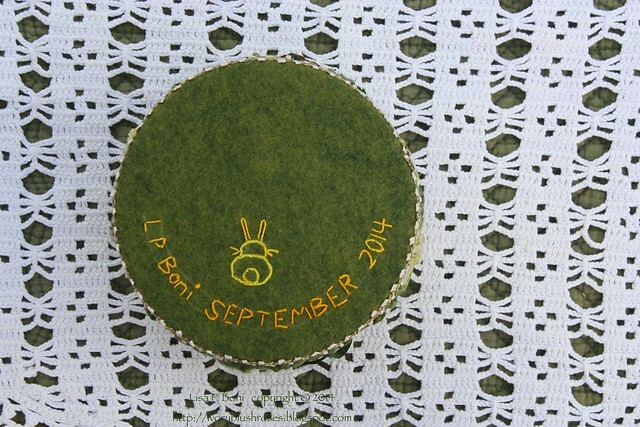 This year, September was surprisingly green so I pieced a green block as the background for this pincushion. 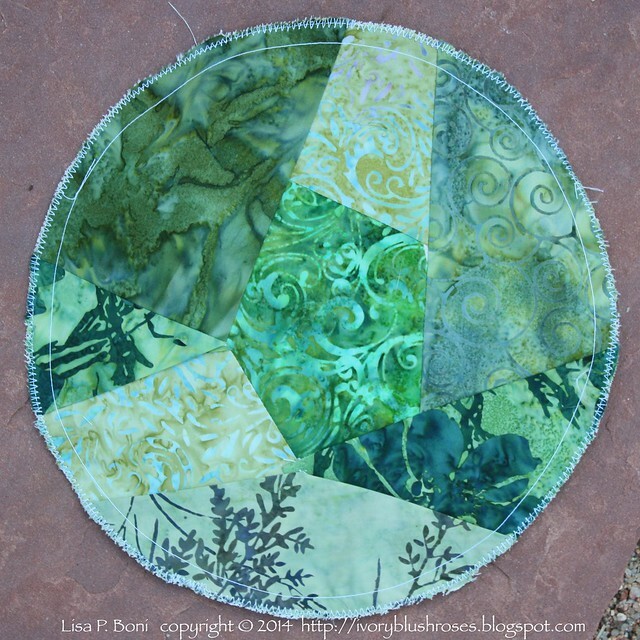 The center fabric made me think of my green lawn. In hindsight, I wish I'd used the lighter green and blue fabric as the center, but it still worked out. 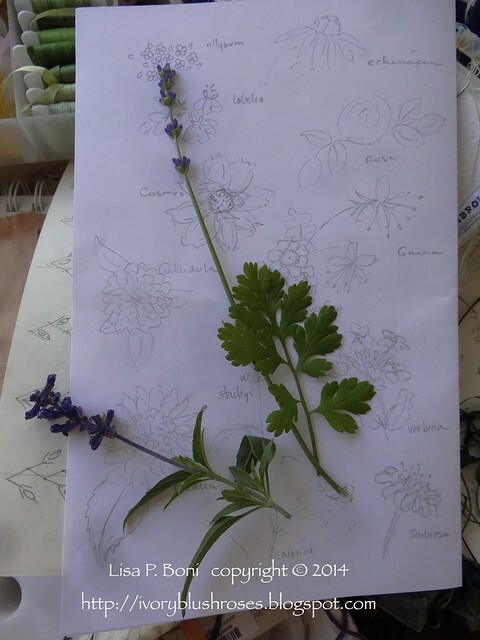 For inspiration, I went out to the garden and sketched various flowers that I thought I might include. 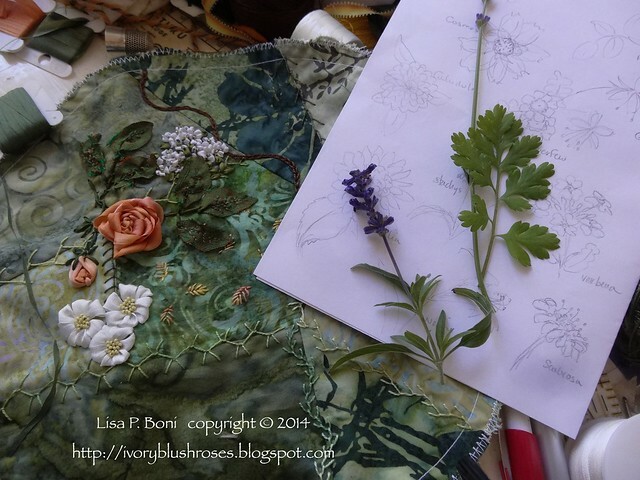 When it came time to stitch, I plucked a few specimens for reference, especially when it came to color and leaf shape. As I stitched, I used the samples as my reference. You'll note that I stitched all the seams, even though I didn't actually embellish them. 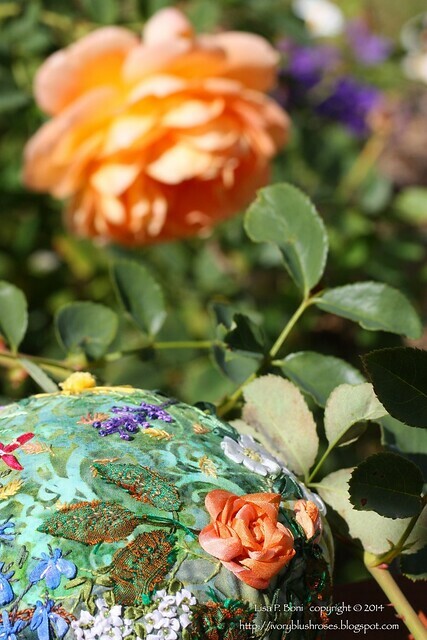 They still provide a good foundation for the flowers stitched on top of them. 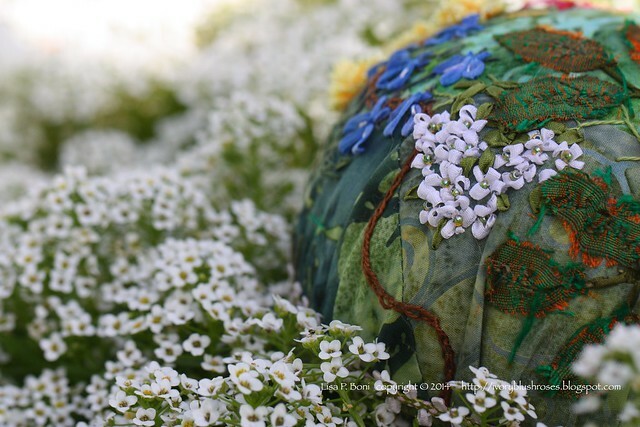 All the flowers stitched are flowers present in my garden. Here the "Lady of Shallot" English Rose and Sweet Alyssum. 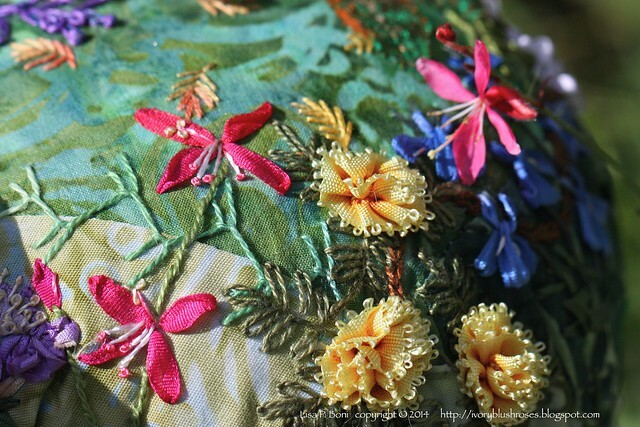 The real magic happened though when I decided to take portraits of each stitched flower with it's real counterpart. 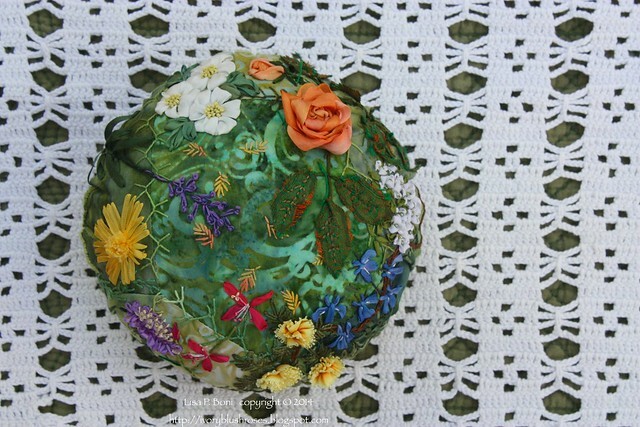 I'm just thrilled with how they all turned out and that I was able to capture a bit of my garden on this pincushion! My usual signature on the back. 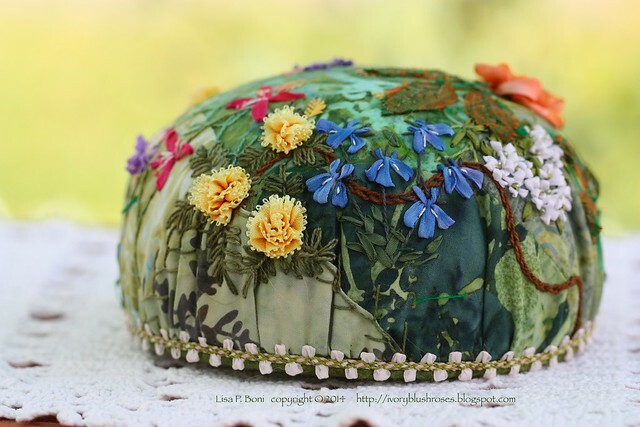 And to end this post, a look at all the pincushions I've done for CQJP 2014 except for my daughter's Ring Pincushion, which she has at the moment. 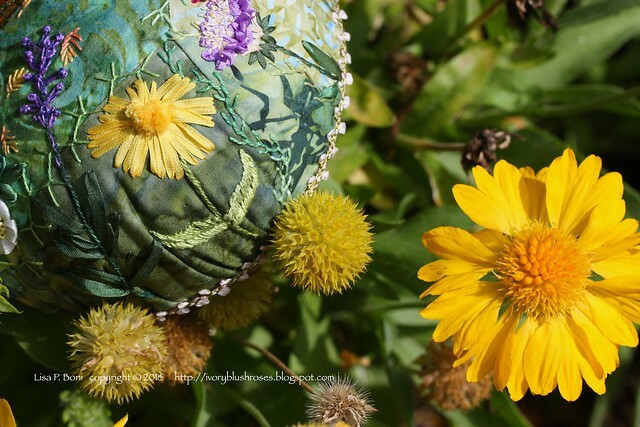 My favorite is still the sunflower pincushion. My least favorite is the May Lilies of the Valley Pincushion. I love having them all together like this though. 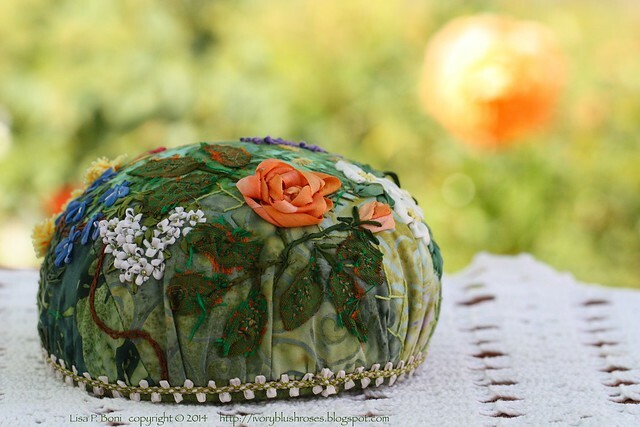 It's a lovely look at how my stitching has progressed throughout the year! 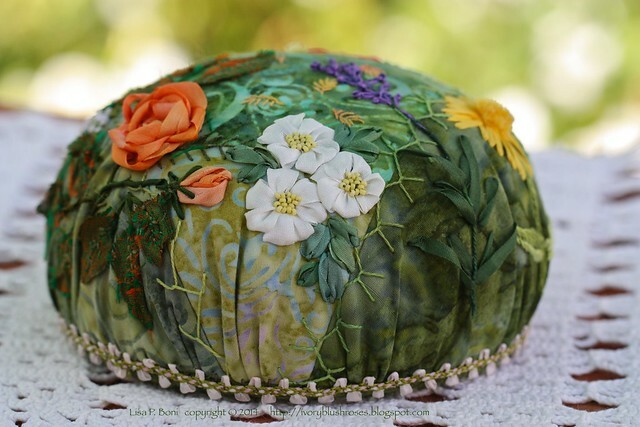 I can't wait to get started on October's pincushion! I have some fun ideas for it that I'm looking forward to trying out! In the meantime, I've got a couple of round robin blocks to finish up and need to get over this bronchitis that has had me down for the past week or more. 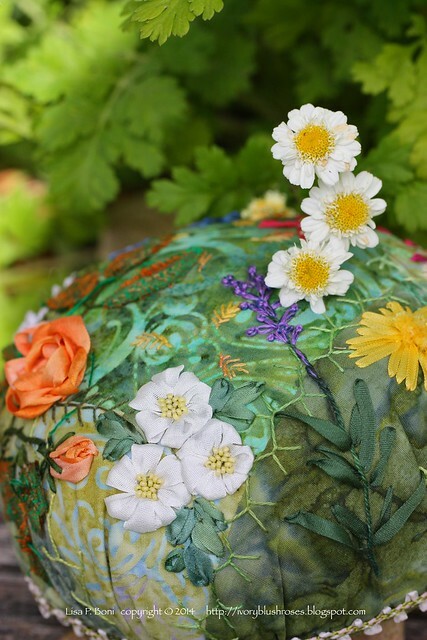 Another beautiful pincushion - and such pretty photos alongside the real counterparts. Beautiful. I'm so inspired to do one too. So lovely. Oh my gosh Lisa! 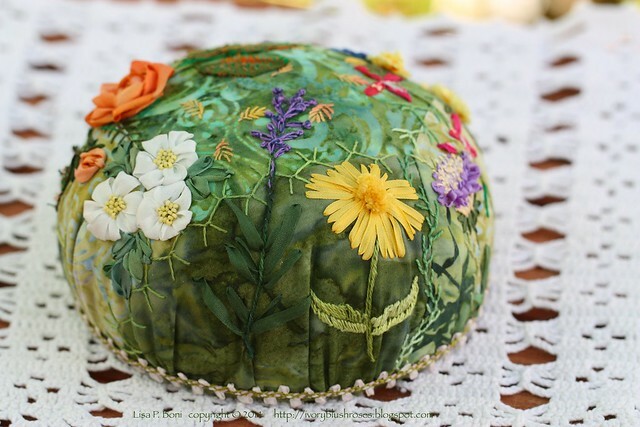 This pincushion is just wonderful! I feel like such a novice after looking at this lovely creation of yours. You inspire me to keep learning and practicing though and I thank you. Truly beautiful! 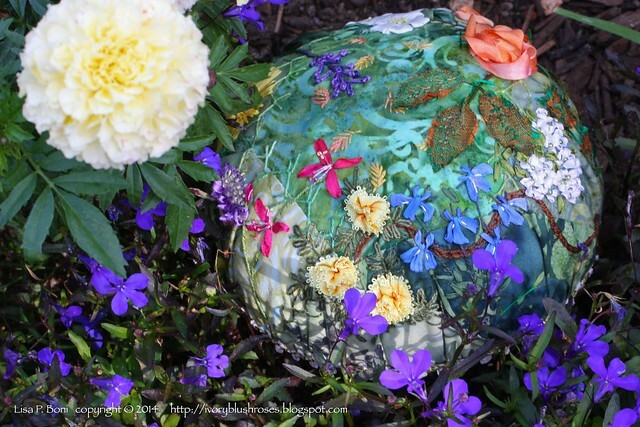 I adore your blog, it is such an inspiration. Thank you for sharing your work with us. 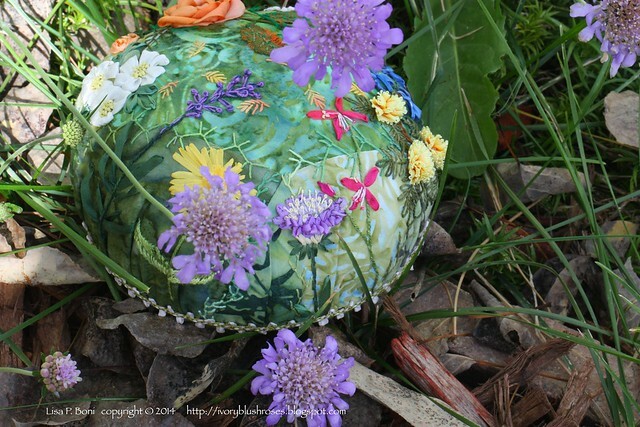 The photographs of the pincushion with the flowers in your garden are absolutely gorgeous! I loved seeing the collage of all of these photos together on Flikr too! Stunning! 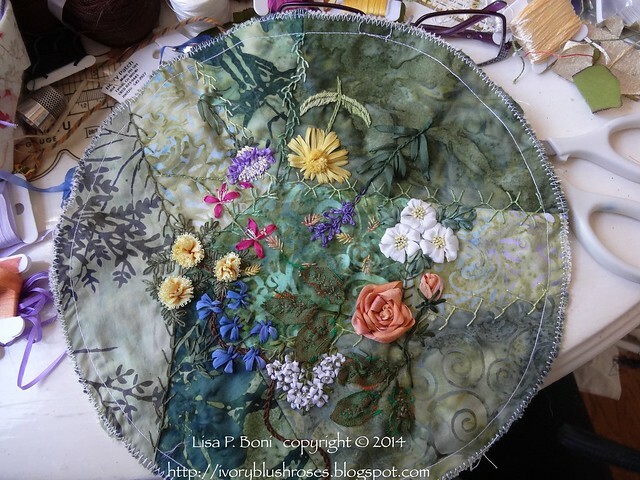 Oh to stitch like you do! I came across these photos on Flickr, and had to search for your blog. Your needlework is so fine, such artistry! 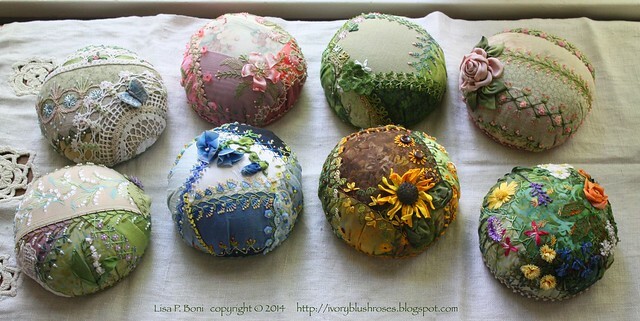 I love these pincushions, and the photos of them nestled amongst the garden are just so sweet. Stunning, Lisa!!! This is my favorite by far and I, too, love the pics beside your work...just a work of art!! Hope you feel better.